Tiffany Hines, left, Natalie Ramsey, Sonya Balmores and Suzie Pollard get set to shoot a scene for "Boarding School." The smile across Sonya Balmores' face could not be cheerier. The Kauai-born-and-raised surfer, model and wannabe actress has just completed a beach scene in the fifth episode -- "Wing Chicks" -- in Hawaii's newest television series. The tentatively titled "Boarding School" is set to debut in April on the N network, which is carried in Hawai on digital cable and satellite TV. Balmores, who plays Kai, one in a quartet of female stars, is chatting it up with the show's co-creator and director, David Brookwell, waving to co-producer Brian Keaulana, and greeting most of the 60 crewmembers by first name. "This is a dream come true for me," says Balmores, 19. "I can't believe how much fun this is. I love it." Then Balmores adds something guaranteed to make her agent cringe: "I would do this for free, for free!" The show will follow four teenage surfers chasing a dream to become world-class professionals, competing with the men. The girls share a beachfront house -- a home at Maile beach. Viewers can expect some "local/haole friction," Balmores says. "There are girl thugs, but if you go anywhere there's going to be girl thugs. It's not necessarily just because they are local that they're thugs. There's going to be some bad stuff that mainlanders do, too." Besides Balmores, the girls are played by Natalie Ramsey as Lacy, Suzie Pollard as Dawn and Tiffany Hines as Birdie. The show also stars David Chokachi, Ross Thomas and another Oahu actor, Jason Tam. "Boarding School" is a low-budget show -- less than $400,000 for each of the 20 half-hour episodes. Shooting began last month and will wrap in December. Eighty percent of the crew is local -- many say they left ABC's "Lost" to work in a less frenzied environment. Keaulana and company also are hiring top local surfers to double for the series' stars. Tiffany Hines, left, Sonya Balmores and Natalie Ramsey flash shaka signs. Balmores, 19, is from Kauai. Co-creator Brookwell says the series, produced by MarVista Entertainment and Brookwell McNamara Entertainment, originally was to be a "tween show" with all four girls in high school. But the network wanted two of the girls to be older, "to make the show more sophisticated to attract an older audience." The similarity to the 2001 film "Blue Crush" isn't lost on Brookwell. In fact, "Boarding School" has been tagged "Blue Crush meets Real World." "It's certainly accurate in some ways," Brookwell said. "But we want to deal with real teen issues, so in that regard it's a completely different setting. This show is about how girls can do something like this. But we also deal with the commercialization of the sport of surfing, who sells out or not." Veteran actor David Chokachi, 37, shakes his head when discussing being "the father figure," living in a house of beautiful young women "who mostly wear bikinis." Chokachi easily fits the part with his tan, buff physique and blond hair. He has several years' surfing experience, beginning with "Baywatch." "Justin is the girl's guru and surf instructor; an ex-pro who's lost his way in life," Chokachi says. "His surf career is kinda over, so he's at a crossroads when a friend comes to him and says here's an opportunity to work with these girls. ... He has to make sure they train, don't stay out late, and show up to events on time. I'm grooming them for a pro career." Taking the "Boarding School" role was a no-brainer. "Instead of working on a soundstage five days a week in L.A., our stage is Makaha beach." Of the female stars, only Balmores had actually been on a board until they were hired and took lessons in Southern California, then Waikiki. "Boarding School" executive producer David Brookwell, left, and co-producer Brian Keaulana watch a scene being filmed, as Bob Hayes, director of photography, watches the monitor. Canadian Suzie Pollard, who plays Dawn, had been scared of the ocean. "I took four lessons and now I can catch a wave and stand up, but no way am I any good," she said. "But with Brian's (Keaulana) help, I'm going to get good." Dawn, Pollard said, is "definitely the partier" of the female quartet, but that's how she deals with the stress of surf competitions. Nearly all of "Boarding School" will be filmed on Oahu's west side -- Makaha Beach, Maile, Waianae High School and the Makaha Resort -- though a second team may shoot the North Shore's giant winter surf. The character Birdie works at the resort while Lacy attends Waianae High School. Makaha native Keaulana is ecstatic that the production not only is filming a few hundred yards from his home, but that he was able to convince Brookwell and McNamara to include film and television students from his alma mater, Waianae High School. "This is the first production that's ever incorporated a high school into getting up close and working to learn how it's really done," he said. "The kids come down here and get involved in every aspect of the show. They don't just observe. They can ask questions to any of us, including actors. This is the greatest gift any production has given to us." Keaulana is determined that the level of wave riding be of "the highest caliber." 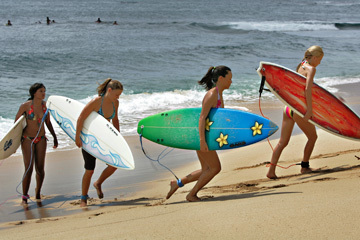 He held a "mini-boot camp" for the actresses, familiarizing them with paddling, catching waves, duck-diving and other techniques. "I shed some serious reality with them ... about how much time and effort and energy it's going to take them to do even little things on a board -- and to be prepared and in shape." Jason Tam, a Punahou grad and Broadway alum, is another local "kid" who can't believe his good luck in getting a role on a Hawaii-based show. His character is 18-year-old Kurt "Shoe" Shoemaker, who maintains the girls' surfboards. "He's very outgoing and eager to have a business of his own some day," says Tam, whose parents live in east Oahu. "But it doesn't hurt that he's around all these beautiful women." It isn't lost on Brookwell that the pursuit of real dreams by the actors and the make-believe dreams of his "Boarding School" characters are not dissimilar. "This show has a lot of wish-fulfillment in it for everyone," he says. "Two years ago I had just returned to Hollywood from Fiji ... and thought I had to get out of there and involve surfing in a show we would do in Hawaii. And here I am." David Chokachi, right, plays a father figure to four young women in "Boarding School," being filmed on Makaha.